Burton Jewelers is continuing Alfred Currier’s “Sharing the Beauty of Travel” an oil impasto gallery show inspired by his travels. Also, we will be showing brilliant and unique collection of natural fancy colored diamonds and Canadian sourced diamonds from all over the world. The Good Stuff Arts Gallery is excited about the new Show: “Artist’s Choice,” with more than 20 local and regional NW Artists on display. A wide variety of styles, mediums, subjects and sizes will clearly and in a colorful way demonstrate the talent we have in this region, New artists to the Gallery are: Maggi Mason, Collage on gessoed board; Lynda Ransley, Live Edge Wood Art Tables and Resin/Mica Paintings; Linda Lenhardt, Glazed Hand-Formed Stoneware Wall Sculptures; Ginny Neece, Pastel Paintings; Jan Fagan, Colored Pencil on Copper Jewelry; and Marcel Schwarb, Acrylic Paintings. Our April featured artist is Pat Sayre, who favors acrylic paintings of all subjects and styles. Join us for Pat’s free demonstration during Art Walk Night, from 6:30 – 8:30 p.m. Gallery hours: M – F: 10 a.m. – 5 p.m.; Saturdays: 10 a.m. – 4 p.m.; and Sundays: 11 a.m. – 3 p.m.
Red Salon is excited to welcome photographer Mark Gardner for the month of April. Following in a long tradition of fine-art photographers, he uses the modern camera and darkroom to make images that interpret what he sees around him. Mark tends to photograph whatever he is curious about, and he is curious about a lot of things. Thus, his subjects range across a wide spectrum that includes people, culture and nature. He works in both color and black & white, choosing one or the other depending on which one best fits the photograph he wants to make. Once finalized in the digital darkroom, his images are then printed on archival papers with pigment inks to create the final photograph or optimized for digital display on the highest resolution screens. Rainshadow Arts Studio will feature Dona Reed, showing new linocut prints and assemblage, as well as a wide assortment of existing work. She’ll also be demonstrating print making. Work will be available on hand-made paper and hand-mounted on wood panels. Pelican Bay Books & Coffeehouse’s is excited to host Skagit Valley legend and textile artist Dorothy Bird’s quilted clothing during the month of April. As usual, Ben Starner will provide music for the evening of Art Walk. Scott Milo Gallery presents our 3rd annual Tulip Festival Artists, Past & Present show featuring 2019 artist Ben Mann and his whimsical, brightly colored paintings. 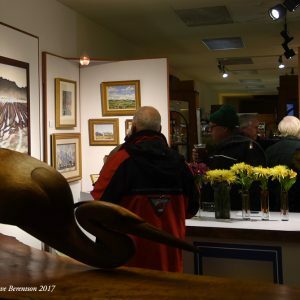 Also showing are color photographs by Randy Dana (2000 & 2003), Jennifer Bowman’s acrylics (2004), Bart Rulon’s watercolors & acrylics (2009) and John Ebner’s watercolors (2010). Also new to the gallery is fused glass by JLS Studio and small bronzes by Walker Bronze. It’s also quilt month. The Majestic Inn and Spa presents new paintings by Caroline Garland and Donna Nevitt-Radtke of Anacortes. Caroline is an award-winning artist of Washington and Alaska, creating works in oil, acrylic, and pastel that reflect her appreciation of the beauty of the landscape. She pushes the limits of style to show old subjects in a new light. Her works are evocative and energizing. Donna paints NW scenes using primarily oil in an impasto, impressionistic style, sometimes almost abstract.